The numbers of triathletes in Asia is raising exponentially, but so is the formats of events and numbers of races. From kids race all the way to ironmans, athletes in this region can experience all types of events. One particular format that is gaining popularity, is off-road racing, XTerra is the world famous series with 9 races in the Asia-Pacific (Philippines, Malaysia, Japan, New Zealand, Australia, Saipan, Korea, Tahiti). 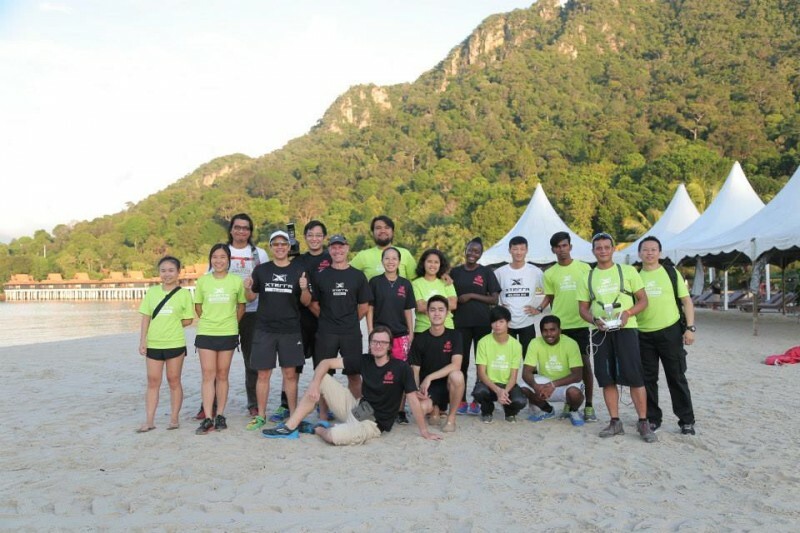 Xterra Malaysia had a bit of a false start when in 2009 the event was experimented with in Kuantan, Pahang on the East Coast. Sadly I couldn’t do that event and remember being as I was working in Taiwan at the time and remember being very sad that the organizer wasn’t able to continue the event for the next year. 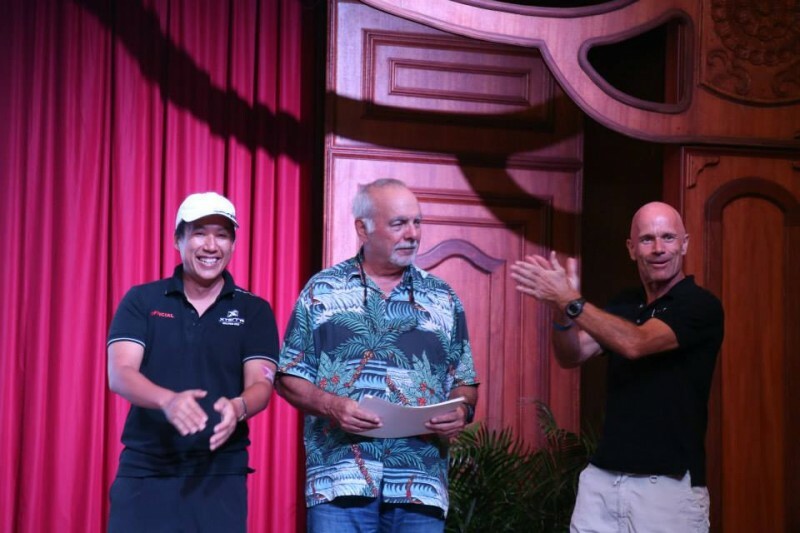 I think this upset a lot of triathletes in the region as it was recognized that Malaysia was a great destination for this race format and fortunately one of these was Sean Chee, the current Event Director, and his company Radius where he is Executive Director. 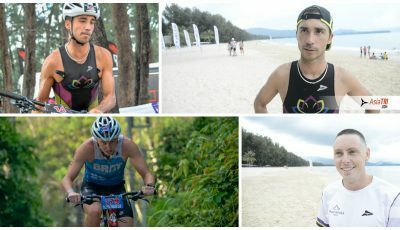 Thanks to his passion and enthusiasm for the off-road format of racing he was able over the next 3 years to convince Team Unlimited in Hawaii, who are the franchise owner of Xterra, his own Board at Radius and the Ministry of Tourism of Malaysia to bring the event back to Malaysian soil in late 2012. I was fortunate enough to be invited on to Sean’s new race management team at that time as the course designer and eventually race director and with him and this new team we put on our inaugural Xterra race in May 2013. This was done in Putrajaya, Malaysia’s federal administrative centre and the new seat of government. We returned her in 2014 but due to the needs of residential development in this evolving city we moved the race last year to the tropical island of Langkawi. This was a much more appropriate home for the race as the idea of bringing this race format was to promote the naturally adventurous and spectacular coast line and forests that Malaysia is blessed with and to promote the importance of nurturing and cherishing this environment amongst the local community as well as promoting it as part of a eco-friendly tourism destination to foreign visitors. 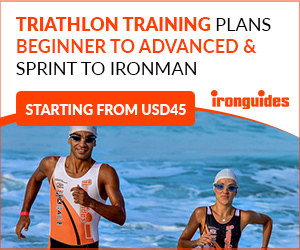 What can athletes expect from the course and the whole XTerra experience? The simple answer to these two questions is that athletes can expect exactly the same thing as they get with every other Xterra course around the world. Namely, they’ll get something uniquely challenging and different. That is the only consistent thing about Xterra it’s inconsistency of terrain and trails that you race on. Racing across earth (“terra” is Greek for earth and “X” is for the concept of crossing it as in cross country) and all of Mother Nature’s forms of it requires a racer to constantly adapt and assess the right approach and the best line to take. This removes the predictability and the repetition that many racers experience on-road. This is what makes the off-road Xterra experience so different to racing on-road where no matter what, the tarmac that you race on, is always going to be the same wherever it’s laid. 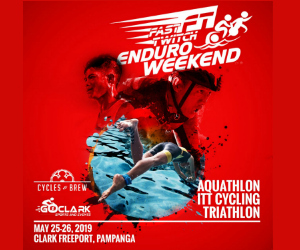 Hence the term tarmac tedium that many experienced triathletes are starting to experience, making the Xterra off-road experience more intense and extreme at times but giving you a feeling that you are definitely more connected and more alive. 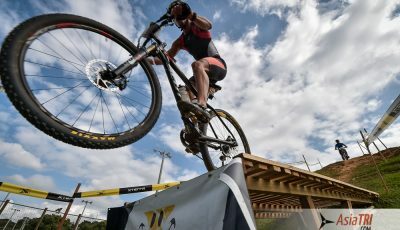 XTerra Malaysia offers a sprint distance race for less technical riders and beginners – what is your idea with that format? Every race format on-road or off-road needs to have different race distances to accommodate the less experienced and the less fit. In addition to helping these athletes the sprint distance for Xterra Malaysia also removes not just distance but also the degree of difficulty of the bike course e.g. the serious climbs and the even more serious descents). As someone that grew up in the city and who came into biking rather late in life I particularly recognize that many of us that now enjoy biking did not grow up riding our bikes down daring downhill sections of trail. As a result, riders like me need time to transition to the technical sections of a Championship course so our sprint course in Langkawi completely takes the really serious sections of bike trail out of the equation. This still gives racers the thrill and joy of the off-road experience without extremeness and intensity of the full Championship course so that they’ll want to come back to do it again and develop their skills as much as their ability to do the distance. 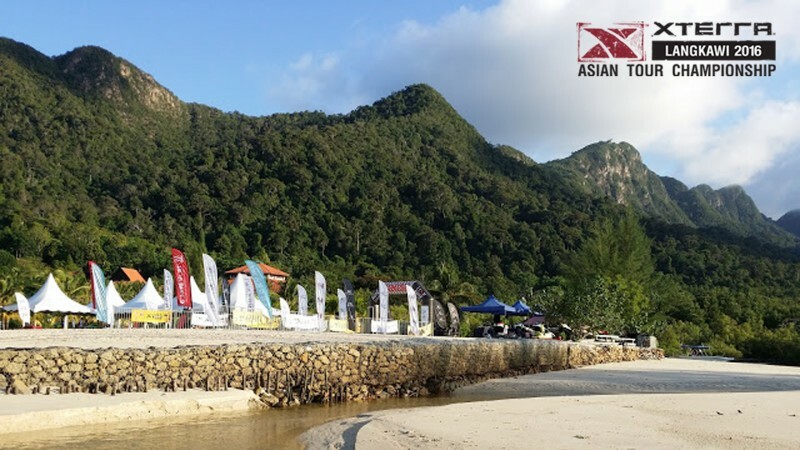 How do you see the off-road triathlon scene in Asia? I see the off-road triathlon scene just as I saw the opportunities in Asia when I first can here 16 years ago. Namely, exciting, dynamic and diverse thanks to the opportunities and resources at our disposal to find places to race that are really spectacular places to go and visit as well as race in. That said, I also see the scene as niche and way smaller than the mainstream development that is going on full steam at the moment with the on-road format of triathlon. Personally, although there are commercial challenges with this I really hope this continues and the triathlon scene avoids the mass participation route that a lot of trail run organizers seem to be going down where they cram 1,000’s of racers into a trail that cannot cope with this volume of footfall. As not only does this destroy the environment, it also destroys the experience of escapism and creates the same congestion that is on the roads during rush hour as a participant experiences when they are going to work during their week. You are a triathlete yourself, tell us about your history in the sport and what is on your calendar for the rest of the year. I came into triathlon like many “MAMILs” (Middle Aged Men In Lycra) late in life and by accident really. After a great wake up call just before my 40th birthday (2001) by a Doctor who told me that I would end up like my Father (he died just after his 40th birthday of a massive heart attack) and who I probably owe my life to, I had slowly been turning the “Fat Little Banker“ I had become into something that might avoid this doctors prediction for me. I’d done this by playing initially some squash, then some soccer and along the way had by 2004 been able to run a marathon. At a subsequent one (I was doing one annually) someone asked me if I could ride a bike and when I said of course, they introduced me to an event called Powerman. Liking the sound of this (the power of a name) I did this and at this event someone else asked if I could swim and when I said of course, they introduced me to Ironman (an even more powerful name J) As a result, heyho presto, I found myself in the water in Langkawi in February 2009 to complete my first Triathlon, the Langkawi Ironman. Having not only survived this but discovered that British Empire building male trait called masochism I was smitten and the rest as they say is history apart from the discovery for a preference to perform this off-road that was discovered in 2010 when I learnt the art of falling off a Mountain Bike which I’m semi proud to say I managed to do repeatedly and rather dramatically. In 2011 I took this skill Cebu in the Philippines to do my first off-road Triathlon and amazingly ended up qualifying for the World Championship in Maui for the 50-54 age group category. In October of that year I went to Hawaii and whilst I didn’t do so well just like the schoolboy on his first day in the playground I vowed that despite being somewhat humbled I would return again. Sadly, despite thinking at the time that this would be like so many Xterra Warriors an annual pilgrimage, 2012 saw me shatter my leg in a ridiculously silly piece of footballing instance involving me, myself and I tripping over my own two left feet basically. In the process of a very slow recovery I discovered the joy of helping at events and by 2013 had ended up as I mentioned earlier being invited in to Sean’s team to deliver Xterra Malaysia that year and that’s what I have been doing ever since in terms of events. Along the way I have been fortunate enough to have been asked to become an Ironman Bike Course Referee to train and coordinate Marshaling teams to act as “Draftbusters” and help out a friend with their kids triathlon event that we have gone on to create a little mini series of 5 events in and around Kuala Lumpur, Malaysia where I like to spend as much of time as is possible. These events will help keep my calendar in 2016 nice and busy in terms of helping others discover the Xterra Live More lifestyle. Slowly, as I have regained the strength and rigidity in my leg and more importantly the confidence to go hard in the trails, the feeling of being able to Live More from events that I do personally has returned and this year I have also added some serious personal race plans of my own that see me targeting a return to Maui and the Xterra World Championships in October in the 55-59 age group category that I have now moved into. Also, following a successful request for selection to Team GB’s age group team, in November I will also race the ITU Cross World Championships that will be held in Australia, the first time this event has come to the Southern Hemisphere proof that the off-road Triathlon scene in Asia will attract new converts from the mainstream sport on the road.